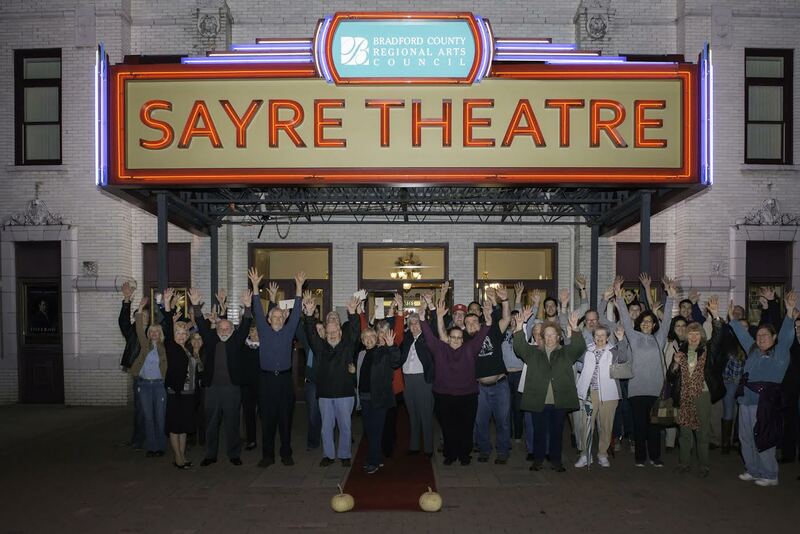 Just in time for the holidays, the Sayre Theatre is aglow again with the installation of the new Sayre Marquee. The Grand Lighting ceremony took place on October 29. 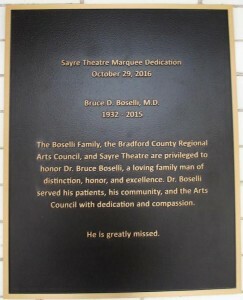 It was the perfect evening to honor the late Dr. Boselli and his family for their generous contribution to this beautiful theater. Nearly 100 people in attendance learned about the history of the marquee and how the restoration project unfolded, while all of the groups and individuals who helped bring this project to fruition were honored. Installation of the marquee is nearing the end. The soffit and lighting under the marquee canopy is being completed, dedication pavers and bricks in the brick plaza have been installed, and Granite Works is moving forward with the construction of the base designs, which will cover the steel supports in marble bases and architectural coverings. The BCRAC staff and board members have extended their gratitude and heartfelt appreciation to the following contributors: Dr. Bruce Boselli and Family, Hunt Engineering, Jeff Paul Plumbing and Heating, Nucor/Vulcraft, Mattison’s Bucket Service, G Webster Contracting, Porter’s Concrete Service, Austin’s Excavating and Paving Inc., Corning Foundation, Bradford County Commissioners, the Holiday Home Tour, Guthrie Clinic, Croft Lumber, the 100th Anniversary Sayre Committee, the Guthrie Turkey Trot, the Sayre Marquee Committee, Horn’s True Value, American Legion Sayre Post 283, Granite Works, Gary Baker, Brooks Eldredge-Martin, Orchard Family, Kochin Family, Christopher and Elaine Poost, Daniel and Marie Kwasnoski, Gary and “Mike” Sumner, Sayre Rotary, Sayre Theatre Staff, Ali Bennett, Red Door Photography, Chuck Carver for his talents as Master of Ceremonies, and the Borough of Sayre, as well as those who request to remain anonymous. Their continued support and patronage are invaluable as this and other projects move forward. 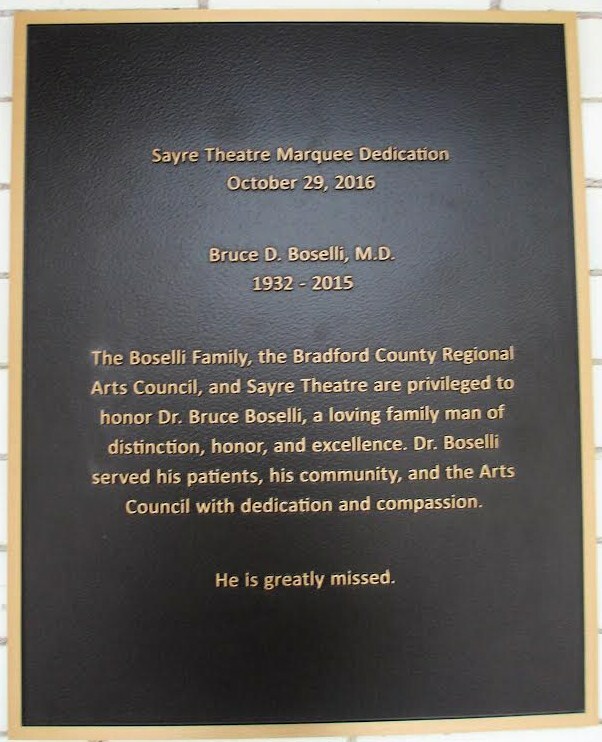 About the Sayre Theatre: Opening December 31, 1914 and has remained opened through the purchase in 1994 by the BCRAC, transforming the former Opera House into a modern, comfortable and friendly arts center with its official dedication January 1, 2015.